What Thyroid Tests Do We Really Need? This is among the top five questions I get asked in emails or social media messages on a regular basis from women that suspect something is up with their thyroid. Often they’ve had some basic testing done but still struggle with a host of low thyroid symptoms such as fatigue, hair loss, brain fog, digestion troubles or weight gain and are suspicious their testing wasn’t adequate leaving them understandably frustrated. While the testing list below is considered unnecessary by most conventional docs, it does a lot more than rule in or out classic hypothyroidism (which looks like elevated TSH and low T4, more on those below) but rather digs deeper into the various patterns of thyroid disorders that can often be helped by nutritional and lifestyle interventions vs. medications alone. As well it is always important to know if there is autoiummunity afoot, a condition known as Hashimoto’s which is the leading cause (upwards of 90%) of low thyroid in the Western World, more on that below. 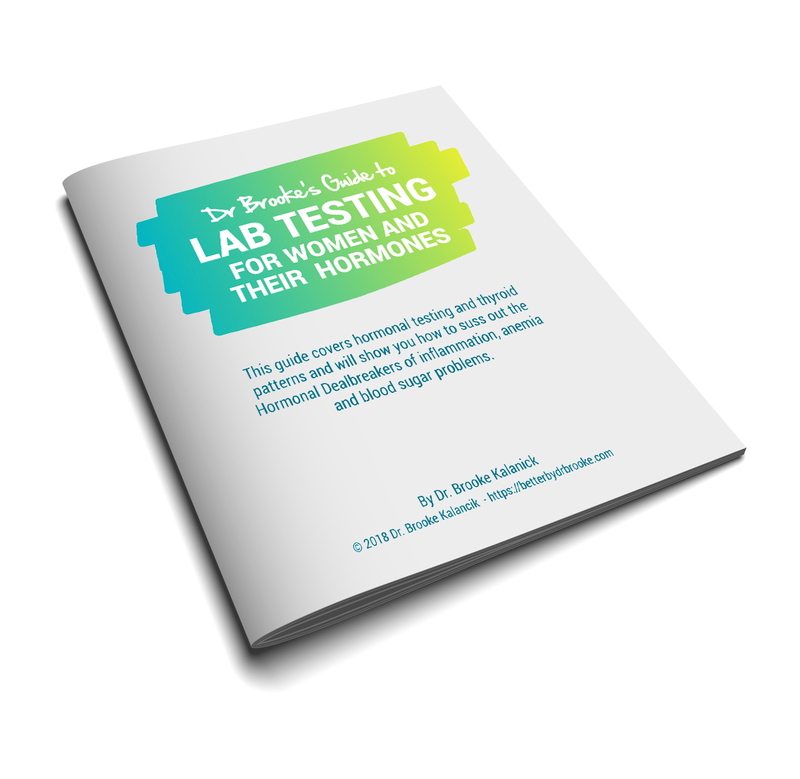 This guide covers hormonal testing and thyroid patterns and will show you how to suss out the Hormonal Dealbreakers of inflammation, anemia and blood sugar problems. TSH – released from the pituitary (in response to TRH) and tells the thyroid gland to make and release T4. As your levels of T4 drop for whatever reason, that signals the pituitary to release more TSH to stimulate the thyroid to make more and more hormone (more T4). So what you see on labs when you are hypothyroid is an elevation in TSH, typically. This marker does move about a bit in some cases and there are special instances (i.e. a pituitary suppression from inflammation, stress or the birth control pill or because you have Hashimoto’s) when you can be hypothyroid and have a normal or even low TSH. A TSH lower between 1.0 and 1.8 is typically disregarded and low TSH is often only addressed when it is very low and a HYPER thyroid condition is suspected such as Grave’s disease (another autoimmune thyroid issue) or thyroid medications are dosed too high. But a TSH below 1.8 is worth investigating as those suppression mechanisms above or presence of Hashimoto’s may be to blame and without a robust signal form the pituitary the thyroid may not be cranking out enough T4 to make you feel your best. Total T4 – this is both the free and the protein bound form of T4, however remember that most of the hormones are bound which is why it is important to look at free levels as well. This is essentially the horsepower of your thyroid. A low level indicates your thyroid isn’t making much hormone and when this level drops on labs, in conjunction with an elevation in TSH, you’ll be deemed “hypothyroid”. These two tests together are the basic standard to rule in or out hypothyroidism by the technical definition (high TSH and low T4). However, this tells us nothing about T4-T3 conversion, Hashimoto’s or a host of other thyroid problems you may have. Your Hormones are Talking - Are You Listening? Take the Quiz now. Instant Results. And this combo alone would not tell you WHY you are hypothyroid, i.e. due to autoimmune attack on the thyroid gland (known as Hashimoto’s), iodine deficiency (rare in the Western world), etc. and especially if the TSH is the only test done (still far too common unofrutantely) you would not know if you are low T4 unless that is tested as well. A normal or even low TSH combined with a low T4 is what is known as subclinical hypothyroidism and is yet another condition served well by nutritional, supplemental and lifestyle modifications. TPO & TG Antibodies – Antibodies can be positive for up to ten years before you become hypothyroid. Research shows that these antibodies with normal TSH and T4 are still predictors of future thyroid problems. And it’s also true that you can still feel like total crap when these are positive and your “thyroid labs are normal” because this immune system activation creates a ton of inflammation and symptoms such as brain fog, fatigue and joint pain. More on Hashimoto’s here. This is why I recommend women get their antibodies tested every 6-12 months and more frequently if they have unspecified hypothyroidism, have been pregnant, have PCOS or are going through peri-menopause or have a family history of autoimmunity or any thyroid disease. If these are positive, we not only have a WHY but we also can work on the cause: the immune system. Many women have been taking thyroid meds for years without any idea if they also have Hashimoto’s. it was either not tested for or was tested for but glossed over or not discussed by their doctor. You may be wondering how in the world this happens? Well truth be told, the treatment in the conventional model doesn’t change whether there’s antibodies or not. Within this model the T4 or free T4 will be monitored and medications dosed accordingly. There is no additional treatment for the immune component when it comes to traditional medicine. Does it matter? Yes it does! First, remember that the antibodies themselves show an activated immune system, a self attack that is abnormal. This tells us that you now have autoimmunity and are at risk for other autoimmune issues (i.e. Crohn’s, Lupus, Celiac, RA, etc.) and these antibodies themselves (or rather this activated immune system) can create all the low thyroid symptoms on the list all the while you have completely normal thyroid testing (TSH, T4, etc.). And the great news is that again diet, lifestyle and some key nutritional support can lower those antibodies, protect your thyroid (and lessen your risk for developing other autoimmune issues) and get you feeling much better. This is the best way to see if you’re converting T4 into T3. This is warranted if you are taking thyroid medications and aren’t feeling great still as you may be getting enough T4 but not converting it into active T3. This is also a good idea if your TSH and T4 are normal but you still have hypothyroid symptoms including: fatigue, dry skin, constipation, difficulty losing weight, hair loss, brain fog, etc. I’ll cover free T3 in a moment as well but total T3 is useful if your Free T3 is low but typical causes of low free hormones are not found. In this case, the pool of total T3 may be small enough that the free T3 is low. In this situation you would want to address conversion vs. just binding protein issues – again, more on that in just a second. Remember, this is a loss of active T3 after conversion from T4 that we can’t get back, so we don’t want to lose too much down that pathway (about 20% goes here normally). This conversion to reverse T3 is sped up by cortisol and inflammation. So this is an important test if again, you have relatively normal looking labs but have a lot of hypothyroid symptoms, have normal T4 but low total T3, if you are under stress (remember stress comes from a lot of places you may not realize, click here to find out where) or if you’re dealing with a lot of inflammation (from blood sugar imbalances, lack of sleep, poor diet, digestive issues, chronic injuries, just to name a few). It’s always good to know how much Free T3 you have, because the moral of the thyroid physiology story is that it’s free T3 that ultimately binds inside your cells and increases the metabolic rate of that cell. You can simply run a Free T3 test or you can infer how T3 is faring by a T3Uptake or TBG test (more on that below). Free T3 is a pricier test so if you’re paying cash one of the other two may be a good option. What creates an actual problem with levels of Free T3 is estrogen and testosterone. Estrogen raises the amount of Thyroid Binding Globulin (TBG), the protein that carries around T3. When there’s more of the protein carrier, too much of your T3 is bound up leaving you with less free, less active T3 around. Testosterone does the opposite, it lowers TBG. This sounds good right? More Free, active T3 around. However, when there’s too much free hormone around your thyroid receptors (found everywhere in your body) get resistant, just like with insulin resistance: they stop heeding the thyroid hormone message. So either way, whether TBG is low or high, you can see low T3 symptoms. So in lieu of a Free T3 test, you can look at levels of thyroid binding globulin (TBG is the test) or you can use a test called T3Uptake. This test has an inverse relationship with TBG, so when T3U is elevated you’ve got low TBG levels (often due to excess testosterone). Conversely, when T3U is low you’ve usually got an estrogen related problem of too much TBG (thus too little free T3). You may want to look at these binding globulin issues if you have any female hormone imbalances such as PCOS, if you take estrogen medications such as HRT or birth control or if you again, have low thyroid symptoms but normal looking TSH and T4. Is your head spinning yet? This is complicated stuff! To make more sense of these low T3 problems, grab this full report I wrote here. 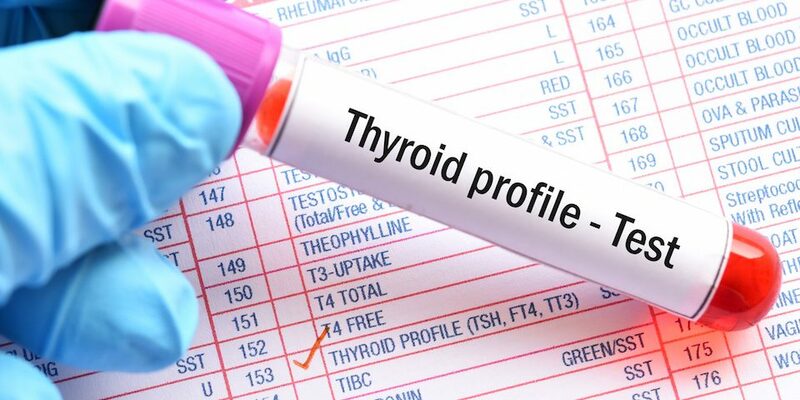 You don’t necessarily need all of these tests run all of the time, but if you aren’t sure what may be impacting your thyroid then it’s best to a big picture view and see what patterns present. This way you can know if your efforts are best spent working on stress or coming off the birth control pill or healing a leaky gut to quiet your immune system. While I strongly recommend you be working with someone who can help you interpret your results, you can get testing if your doc won’t order it through services like Direct Labs. Autoimmune/Hashi – thi sisn’t a thryoid problem/the thryoid problem that’s not a thyroid problem. So often women are tested with conventional testing for low thyroid and if antibodies are checked at all they are frequently told it doesn’t matter if it’s even discussed. Thyroid patterns – why we have to have more thorough testing so we can treat the unique pattern of thyroid dyruviont. Are You Making More Deposits Than Withdrawals With Your Health? What’s the best diet for women’s hormones?